As well as optically isolated relay outputs, the Schmitt AEMS card gives an analogue 0 – 10V signal which can be fed into an external data-logger for quality or monitoring purposes. This data can be interpolated using software such as MS Excel. 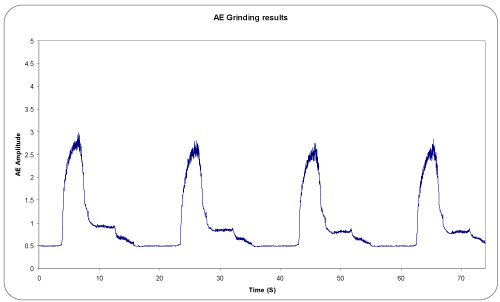 The graph below shows the acoustic signature taken from the grind cycle of an automated cylindrical type grinding machine using a standard external acoustic sensor. Four components have been ground to size over a time period of 74 seconds. Each ‘peak’ on the graph indicates the grind cycle of one individual component, each taking approximately 20 seconds. The acoustic amplitude is shown on the Y axis of the graph. Close examination of each ‘peak’ reveals the initial grind as most material is removed from the part and acoustic signal reaches its maximum. The signal then drops after most of the part's material has been removed. ‘Spark-out’ then occurs and correct part diameter is reached – shown by the flat spot in the graph. The dip in acoustic signal towards the end of the cycle shows grinding wheel-head retraction and the wheel loses contact with the part. This is followed by high pressure coolant being turned off. This cycle is repeated four times for four components.